You are here: Home / Are You Having Fun at Work? A few years ago I found myself diligently working non-stop for three days at a start-up to bring up a website with a team of six people. We were stressed, tired, not having fun, and my boss kept cracking jokes to lighten the mood. Finally, someone asked, “How can you be making jokes at a time like this?”. He replied, “What’s the point of doing this if we’re not going to have fun doing it?”. At the time that didn’t really help our mood, but over the years that statement has stayed with me and has shaped how I approach my career and the work I do every day. Really, what is the point of spending 40 hours a week somewhere if we don’t enjoy it? Throughout my career I’ve worked for some companies where I’ve had little to no fun, but it wasn’t until Achievers where I finally started enjoying my daily 9–5 life. Recently, I went to a conference where I heard Dr. Annie McKee speak. She is a respected academic, speaker, best-selling author of the book “How to be happy at work”, and advisor to top global leaders. According to Dr. McKee, “Life is too short to be unhappy at work”. When we’re unhappy at work, our personal life suffers, our sleep is affected and our relationships take a back seat. Think about it. An average person works about 43 years in their life. That’s 2,236 weeks, and 89,440 hours of being unhappy. That’s a BIG part of your life! Dr. McKee says the three keys to being happy at work are purpose, hope, and friendship. We all strive to find purpose in our day to day lives, whether it’s with eating healthy, making time for friends and family, or exercising. Having purpose should be an equal priority. This purpose needs to come from the leadership team. 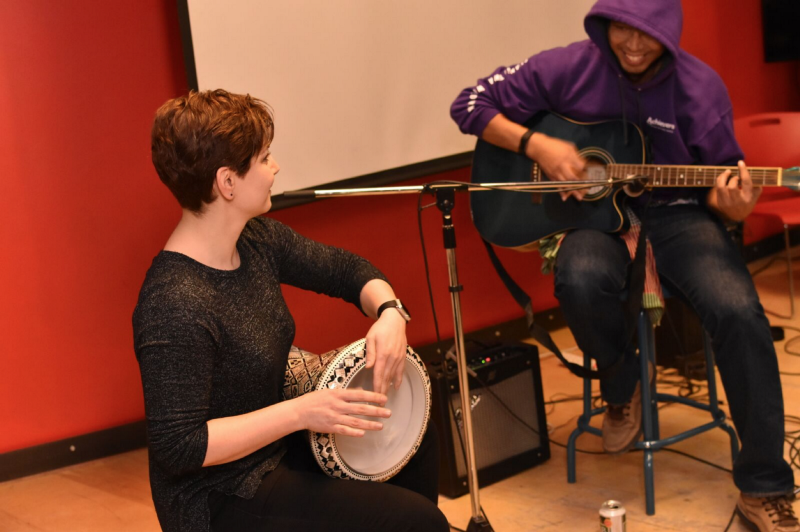 “Having a sound, clear, and compelling purpose helps you to be stronger, more resilient, and able to tap into your knowledge and talents,” says Dr. McKee. Similarly, employees need hope to succeed. Purpose drives us to be better today, but hope keeps us on track for tomorrow. Hope helps us get through the days that aren’t easy, the projects that prove to be difficult, and the people that aren’t always pleasant to be around. “To be truly happy at work, we need to see how our workplace responsibilities and opportunities fit with a personal vision of our future. This kind of vision emerges from hope and optimism, which we can, with focus and hard work, cultivate even in difficult jobs and toxic workplaces. When we see our jobs through a positive lens, and when a personal vision is front and center in our minds, we are more likely to learn from challenges and even failures, rather than be destroyed by them,” says Dr. McKee. If you find hope, purpose, and friendships in a company, chances are you will also be happy there. I find purpose through opportunities to develop. For example, I recently joined a team where I was able to learn technologies I didn’t know before such as Docker and Symfony. Achievers is special in that they give employees an opportunity to learn on the job when they see promise in them. I find purpose in giving back to the company because they believed in me. In addition, I have hope because I am progressing in my career. I am able to grow and therefore, I have more mobility as a Software Engineer. Finally, I have found some really amazing friends in my teammates. Some days I laugh so much at work that my stomach actually starts hurting. 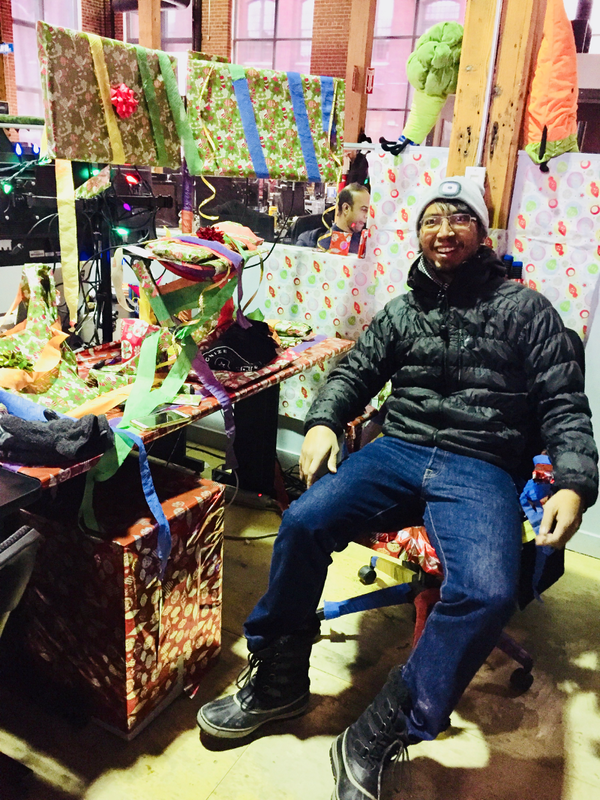 Exhibit A — the day we spent redecorating my friend’s workspace and watching his reaction when he walked in. 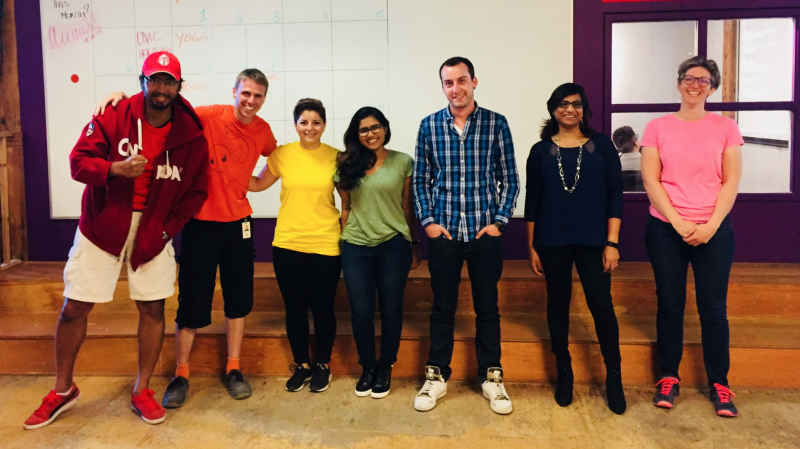 Exhibit B — the day we decided to dress up as skittles. However, those things alone are not enough. 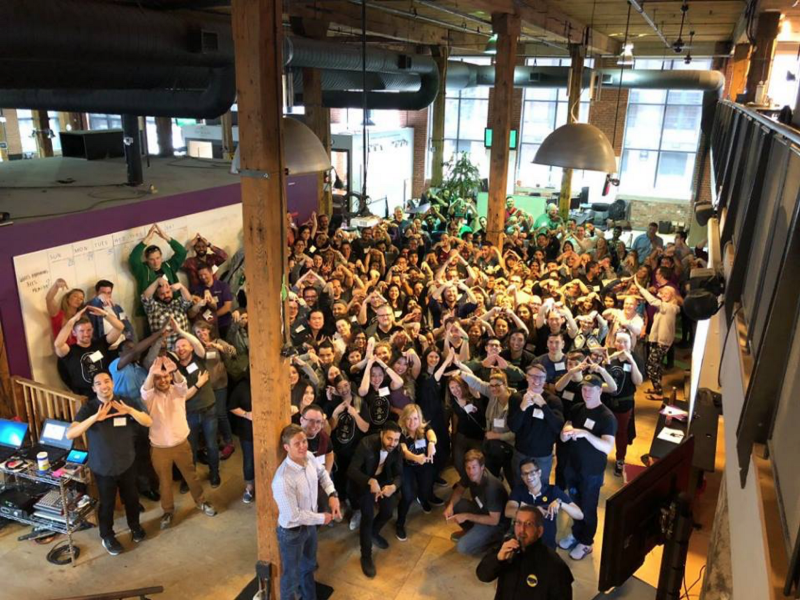 The company goes one step further to create a culture that’s inclusive, welcoming, and fun. At Achievers we have one of the best company cultures I have ever seen. We have weekly Throwdown Thursday parties, epic Halloween weeks where the entire office gets a makeover, an employee appreciation week where we get gifts and perks every day, and a wellness week with fitness challenges and healthy shakes, to name a few. We have a Magic, The Gathering league that includes players from our senior leadership team. 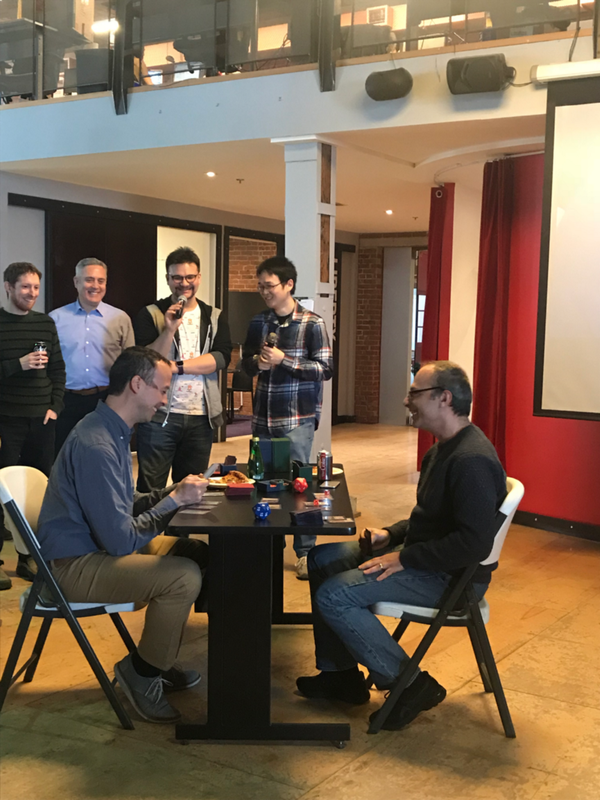 Here we have the CTO, Aris Zakinthinos and the Director of Product, Egan Cheung, playing a Magic match that had play by play commentary, and an audience of about 30 people. We have regular public speaking practice sessions called Speaker’s Corner. Many people, including myself, have a fear of public speaking, so I started this club to let people practice and get over their fear. The company allows employees to take time off to volunteer and also provides volunteer opportunities. We even have a band, along with a music room to practice. Here is a recent performance of our band Operating as Intended. Pikachu was visiting for the day. Recently my friends and I started our own little acoustic band where we meet and just play together. 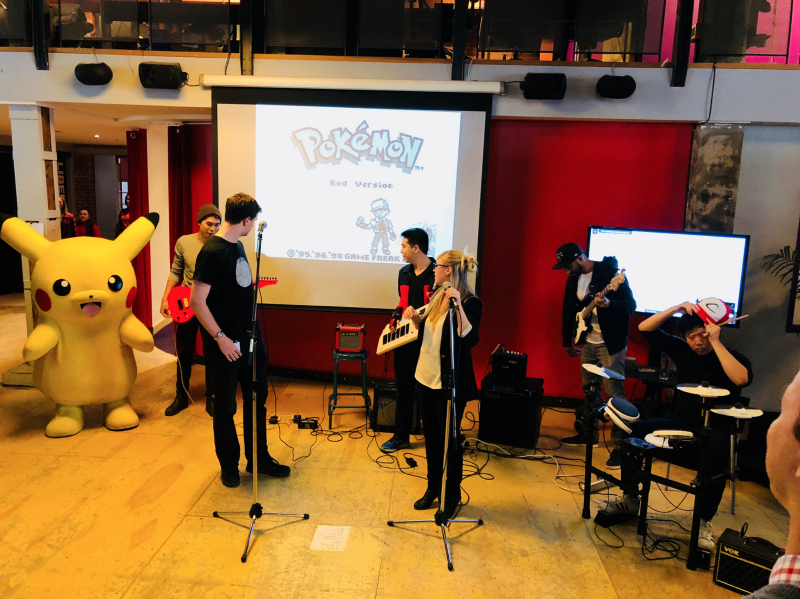 Here we are performing at the office talent show! We routinely go on coffee walks together, and sometimes do 15-minute exercise breaks. We have karaoke, trivia nights, and personal top 1’s where we set a personal goal for the year, and receive $250 towards achieving it. My own personal top 1 for this year is to run an official 5K race. I’ve always wanted to run more so this initiative is providing me with the motivation to do it. Once I finish my run, I can get up to $250 towards anything I spent for the run (i.e. running shoes, clothes, costs of participating). Just this past week we had an amazing afternoon participating in a scavenger hunt, and wrapping up the day with an awesome party. Here we all are before the games began! All of these, along with unlimited food and drinks in the kitchen, makes Achievers one of the best places I’ve ever worked at. In the end, how much fun you have really depends on you. A company can provide an amazing work culture, but you can be as involved as you like. If your company doesn’t have the culture, you can start the initiative. For example, I started Speaker’s Corner and one of our technical support agents started the band. The more involved you get in the culture, in the team, in the activities provided by the company, the more fun you will have at work. This, combined with hope, purpose, and friendship will help make you much happier during your 40-hour work week. That happiness will spill into the rest of your life and who doesn’t want that? Start building an amazing workplace culture with Achievers Employee Engagement Platform, which combines the highest-adopted employee recognition platform with an active listening interface to accelerate employee engagement. Schedule a demo today. Do you want to join the A-team? Apply for one of our open job listings here. Samira Hafezi is a Staff Software Engineer at Achievers. This blog post was re-purposed from Achievers Tech Blog. https://www.achievers.com/blog/wp-content/uploads/2018/07/banner4.jpg 321 845 Samira Hafezi /blog/wp-content/uploads/2015/06/engage_logo-300x1021-300x102.png Samira Hafezi2018-07-05 08:00:572018-07-05 08:12:32Are You Having Fun at Work?